Two exceptional acts are coming to The Brewery Tap in Ipswich on the afternoon of Sunday 6th November. The show will be in the upstairs room of the pub and starts at 3pm. The scope of the Family Elan’s output is broad, ranging from self penned reflective meditations which rotate on a devotional harmonic axis, to irreverent interpretations of Bollywood hits, to Turkic folk forms filtered through a psychedelic rock praxis. Perhaps the unifying strand in all this is a deep interest in traditional music forms and their reinvention through communal group playing. The Family Elan is currently performing as a trio, featuring Chris Hladowski on electric bouzouki/Turkish saz/vocals, Harry Wheeler on electric bass and Mark Hearne on percussion/vocals. 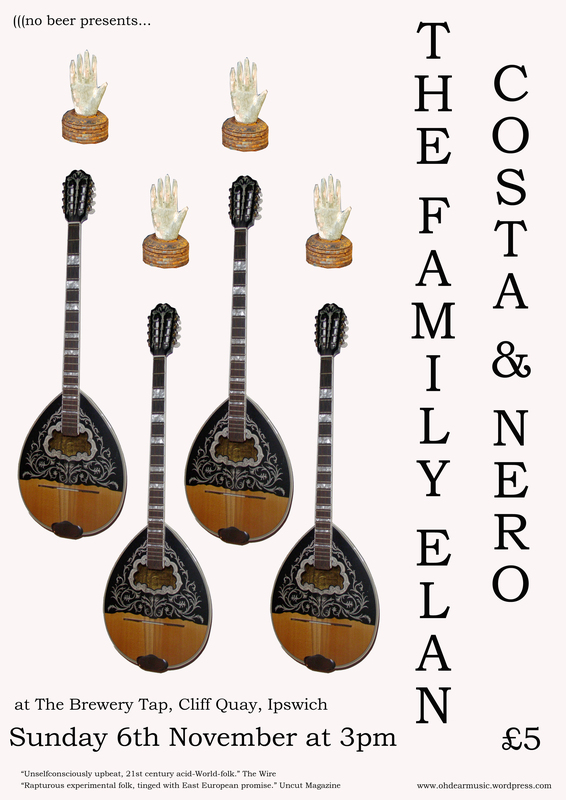 Costa and Nero are a Rembetika duo comprised of Chris Hladowski: Berzouki & Patrick Dowson: Classical Guitar performing lightning fingered classic greek ditties. features andy cabic from vetiver apparently. a total jam. where did the summer go? from gentle spirit. out now on bella union. a beautifully mellow pulsing edit from the Call Me 12″ out now on Merc. Check out the Mark E mix from a Beats in Space show in April 2010 here. from 936 out now on not not fun.